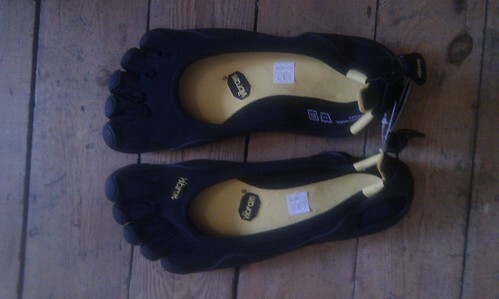 I recently bought a pair of Vibram Five Fingers running “shoes” after reading about barefoot running on the Britmilfit website. I’m not currently doing Britmilfit, but have done over the last ten years and can thoroughly recommend it. Today I was able to put a last minute client rescheduling to good use, and finally had a chance to get out and try these odd looking things out. With a place for each toe, it’s an odd sensation putting them on, a bit like trying to put skiing gloves on your child – where you’re not totally in control of each digit. I’ve worn them round the house a bit already. I was keen to get used to wearing them and to get used to people looking down and pointing at them (in this case, it was my three children, the 16-month old making the oddest noises of surprise). You have to get used to not landing heavily on your heels, which are no longer have a thick rubber cushion. I thought this would feel odd, but it turns out that my instinct took over – probably in self-protection mode – and I found my running style altered itself fairly quickly. Early morning a few Christmases ago in Dulwich Woods I’d popped my right ankle – audibly. It’s never been quite the same since, and I was definitely conscious of it running “barefoot”. But it wasn’t painful, it was just there. On my way in to Dulwich Park I bumped in to local fitness trainer and Goodrich School Fun Run organiser Liz Stuart, and stopped for a brief chat. She reminded me of the need to get used to this new running style gently. I’m glad she did, or I might have been tempted to add in an extra lap of the horse track – which I’m sure I’d be paying for now. Sure enough, I got some funny looks – bemusement, pity, derision, outright hilarity… so I was glad I’d trained for that. I’d worried beforehand about sharp stones, glass, dog dirt. In fact I wasn’t convinced it would work at all running on the pavement. But pavement running is okay, and you just have to be a little more vigilent at spotting sharp or squashy hazards. I kept my first run slow and on the short side – just shy of three miles. One hour later, after stretching down – particularly my calf muscles – I have a very slight burning sensation on the backs of my heels, and my ankle is still there. But generally I feel fine.